The question of how we can accomplish this morally necessary and yet extremely challenging business of building a more equitable food system has been the central question of our work since Come to the Table was founded in 2006. 1. What are the barriers and opportunities for farmers selling into low wealth communities? 2. What are the linchpin points in the market chain where public or philanthropic investment could open sustainable, entrepreneurial food access solutions? I.e. How can we best use our resources to build a more equitable food system? In 2014, we partnered with the University of Missouri to conduct a literature review to determine what data already exists and identify gaps in research. Click here to read the full literature review, or click below to view a summary. Almost all quantitative data available on farmers selling to low income communities is focused on SNAP sales at farmers’ markets. As of 2013, 35% of U.S. farmers’ markets were authorized to accept SNAP benefits. In 2013, SNAP recipients in the U.S. spent $21.1 mil at farmers’ markets or directly with farmers, .03% of all SNAP benefits. In 2013, SNAP recipients in North Carolina spent $152,000 at farmers’ markets, .006% of all SNAP benefits. There are many new food access initiatives emerging to connect farmers with low-income consumers, such as sliding scale CSAs, food hubs, mobile markets, SNAP at farmers’ markets and more, but little data on the impact these initiatives have on farmer revenue. Even in the case of SNAP sales at farmers markets, although dollar amounts received at farmers’ markets is available, we do not know how many farmers this represents or what percentage of SNAP sales are of farmers’ total revenue. 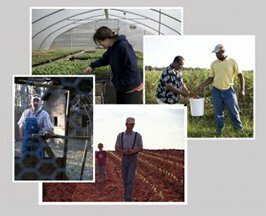 In 2015, RAFI’s staff and NC State University embarked on a farmer interview project to better understand the barriers and opportunities for farmers selling to low income communities. We’ve produced a short report based on these interviews. Click to read it below! Our ultimate goal is to use our research results to support entrepreneurial and community-based solutions to food access. View the Beyond Hunger Relief: Research One-Pager for more information about our work.